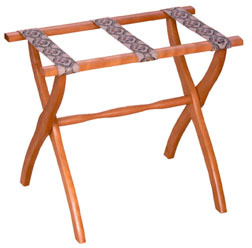 Sturdy contoured leg design in beautiful light walnut with three petit point braid straps blends beautifully with your home décor. Rack holds up to 200 Lbs and can be folded for easy storage. Also all pricing includes Free domestic shipping and more. No sales tax if shipped to anywhere outside the state of Michigan. On-line ordering is of the highest level secure format.